California entrepreneur Jason Levin is a formally trained engineer on a mission. He’s not a hippie, a dope man, or a pot head, but he does see the opportunity in Cannabis. 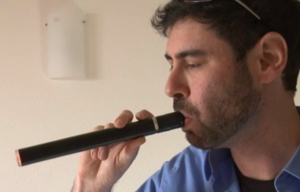 His company, called Uptoke, has produced an upscale vaporizer used to inhale marijuana. The cigar like vaporizer, brings a more “professional” appeal to smoking marijuana. Even in prototype form it’s a well designed, high class looking device. The technology, Levin says, doesn’t actually ignite the plant, but rather heats it up, incredibly fast. The Uptoke vaporizer can get to 375 degrees, in a sealed packages so users don’t burn themselves, in under 6 seconds. The battery life lasts all day and Levin says you just charge it up like a cell phone at the end of the day. Levin doesn’t look like a guy who would fit in a “stereotype”. He sees the opportunity in the Cannabis industry. He’s also very careful not to step on the toes of those who aren’t supportive of the industry. He will not market his device in markets where there are no laws governing cannabis use. He has a legal team in place and has an industrial designer coming on board to help design the final product. Levin is currently raising a Series A round for Uptoke and was just recently in Seattle pitching a group of investors at the Washington Athletic Club. Check out this video of Levin below.